Earlier today, on the radio show Live from City Hall with Mayor Mike and John Gambling, Mayor Mike Bloomberg offered expected support for Forest City Ratner's vastly changed design for the Atlantic Yards arena and arena block, saying the new design was more affordable. Bloomberg, not unexpectedly, did not bring up the loss of the planned office building that was supposed to bring significant new revenues, or the attached Urban Room. Nor was he asked about the Independent Budget Office testimony that the arena would actually be a money loser for the city. Nor did anyone bring up that the reported $800 million price tag is significantly more than the $637.2 million figure announced when the project was approved in December 2006. No one has explained why the cost of the arena has gone up so much. Bloomberg did say that Forest City Ratner and architect Frank Gehry "decided to part company," even though Gehry, at least in some accounts, remains the project's master-planner. But Bloomberg sure sounded like he got his information secondhand. Gambling brought up Atlantic Yards about one-third of the way through the show. JG: The Atlantic Yards project, what’s up with that? MB: It looks like it’s gonna go ahead, which would be great. JG: With some modifications, though? MB: Well, big modifications. Frank Gehry, who is a genius, designed a spectacular stadium, but I think... Ratner came to the conclusion... that in this day and age you just cannot finance something as complex to build as that stadium... There’s no such thing as a straight wall with Frank... I think his buildings are great... but this one, Ratner--they decided to part company, because Ratner couldn’t afford to build--the economics just didn’t work with today’s market, so he’s got another designer, who built some good stadiums, I’m told, and got a design, and it looks like it’ll go ahead, I hope so. Beyond the economics, there's no way to build the arena block as approved. When the project was unveiled on 12/10/03, Bloomberg seemed far more concerned about avoiding an off-the-rack arena--like the design above, which looks much like Conseco Fieldhouse in Indianapolis. He said: I think it’s just fitting that Brooklyn is on the edge of exciting and innovative and risk taking urban design. One of the things I always thought in Bilbao was: wow, this was a building that was approved by local people--the local political process. You think we have to settle for mediocrity and the conventional. They showed we don’t, and you’re showing that we don’t. Gambling brought up timing for Atlantic Yards, without getting to the question of whether the arena could open in 2011, as Forest City Ratner continues to insist. JG: Push the project back timewise? MB: And if you want to have a circus while somebody else has the Ice Capades... you’ll have another venue. The Dolans might not like competition, but competition’s good. Bloomberg likes competition? He's the guy who backed Forest City Ratner's project in 2003, a project that would involve 8.5 acres of crucial public property, without suggesting that the Vanderbilt Yard should come up for bid. 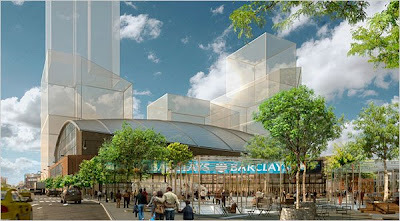 Scrapping a costly sports arena design will help ensure that construction of the long-delayed Atlantic Yards project in Brooklyn could soon begin, Mayor Michael Bloomberg said Friday. Bloomberg said on his radio show Friday that the move bodes well for the project, which has stalled because of litigation, rising construction estimates and the economic downturn. "Ratner came to the conclusion . . . that in this day and age you just cannot finance something as complex to build as that stadium," Bloomberg said. Ratner also apparently came to the conclusion that there was no way to build four towers around the arena as Gehry intended. But he didn't tell Bloomberg.